Yesterday I had one of those moments that make for a rich life. We were at the park and Yakir was swinging next to Zeli. It was a crisp, beautiful Shabbat morning with a sky full of puffy-white clouds. Each moment, the sun would peek out from behind a cloud and then disappear again. I gave Yakir a hearty push and he tilted his head all the way back in the seat and let out the laugh of a lifetime. He held this pose for three or four swings, back and forth, and as he did so I saw him as if in slow motion. The sun peaked out just at that moment from behind a cloud, showering Yakir with a halo of yellow glow. His blond hair swayed back and forth as he tilted his head back as far as it would go and let the swing take him. And his laugh bellowed over the hills and back. Watching him, I felt as if I were seeing a clip from a movie. It was the scene where the hero, recollecting about his early days, flashes to a moment of perfection in a park when he was two. It was a moment, captured in time, of unadulterated glee, of sheer joy. And then it was gone in a flash. And I was left slightly off balance, wondering if anyone else had felt the momentarily slowed hand of time; or if I had been uniquely offered this moment. 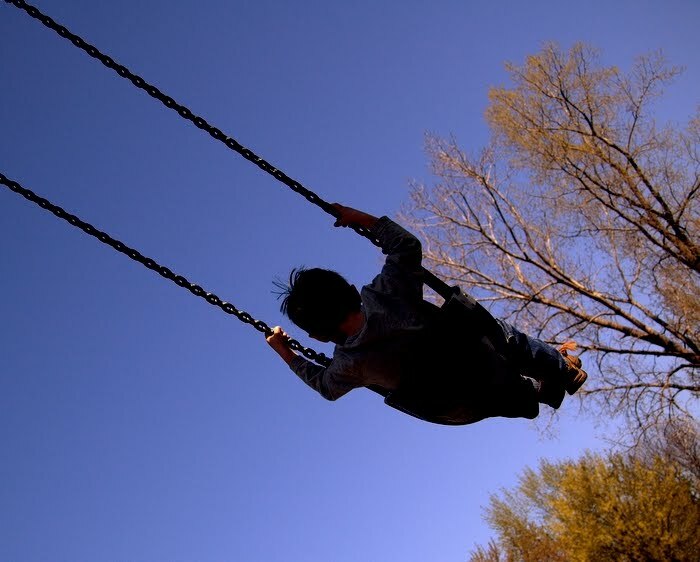 And I felt blessed to have been part of watching a little two year old express the joy of being alive; the joy of swinging with the wind in his hair and the sun shining down on his little face.